Compare prices on car hire in Rouen from all the major brands and find the best deals. When you book through us, unlimited mileage and insurance are always included in the price given. Rouen is a city in northern France , 140 kilometers northwest of Paris .The city is located in Normandy on the River Seine, and is the capital of the Ministry of Seine-Maritime. Approx. 108,000 live in the city, 389,000 with the suburbs. 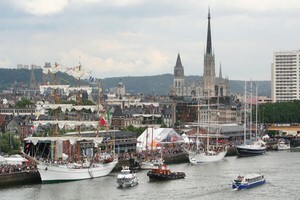 Rouen is one of France’s largest ports and has approx. 12 km long quay. There is a boat from Dieppe and Le Havre to England. The town was originally Celtic, and became the provincial capital of the Roman Empire in 200-number. It was later the capital of the Duchy of Normandy in 911 Rouen is known to be the place where Joan of Arc was burned at the stake in 1431 Claude Monet painted Rouen cathedral facade in several versions. Rouen has many medieval buildings, the cathedral Notre-Dame, which was started on in 1202 and completed in the 1500s. It has a 150 meter high tower. Other attractions include the Abbey St. Ouen from the 1300s, St. Maclou Church, and the Justice Palace and urtårnet Le-Gros-Horloge. The airport is Rouen Vallée de Seine and Beauvais, the two nearest, respectively 3 and 73 miles from Rouen.